Comprehensive performances; China’s Wang Manyu followed by colleague, Zhu Yuling, emerged successful in the opening Women’s Singles quarter-final encounters on the morning of Thursday 6th June at the Seamaster 2017 ITTF World Tour Platinum Australia Open in Gold Coast. 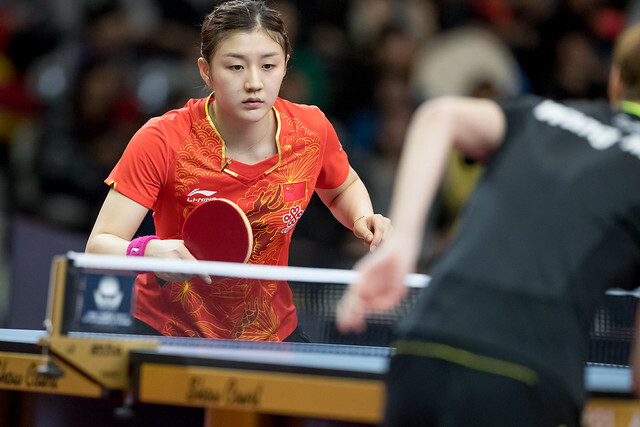 Playing fellow qualifier and colleague, Wang Manyu beat Chen Xingtong in straight games (11-8, 11-4, 11-5, 11-7), before Zhu Yuling, the top seed, administered similar punishment when facing Japan’s 17 year old Maki Shiomi, the player who heads the ITTF World Junior Girls’ Standings. Against a most spirited opponent, Zhu Yuling also prevailed without the loss of a single game (11-3, 15-13, 11-4, 11-3). Time and again, the theory of spin the first ball towards the opponent’s body, heavy rotation as opposed to speed, has proved effective. A blocked return by the opponent from the backhand that is slow and somewhat high is often the result. The initiative is seized and the point won by executing a fast forehand topspin often to the indecision area, where the adversary has to decide whether to execute a backhand or forehand and does neither. Taking a step back from the table the ploy worked for Wang Manyu as the change of spin executed prevented Chen Xingtong establishing a rhythm to her play. Additionally Wang Manyu used the modern day backhand return of service with the forearm vertical and the wrist relaxed to circumnavigate the ball to great success. It helped her seize the initiative and force Chen Xingtong into the passive role. Success for Wang Manyu was followed with success for Zhu Yuling. The top seed dominated the opening game but to her great credit, in the second game, Maki Shiomi caused her illustrious opponent problems time and again. Varying her services, always using the forehand but making full use of her side of the table to vary the angles; she led 9-7 before saving game point after game point. At 11-all, she elected for a “Time Out”, before holding her one and only game point at 13-12. She was not able to convert; the next three points went to Zhu Yuling, the Chinese star had breathing space. Somewhat more relaxed Zhu Yuling dominated the next two games; a place in the penultimate round against Wang Manyu was secured. The semi-final will be played later in the day.